The use of an AutoCAD search tool has enabled Sierra Pacific to significantly reduce the time needed to locate archived customer drawings. 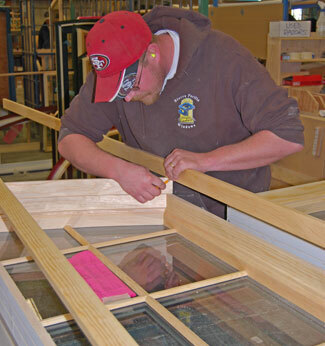 A vertically integrated company, Sierra Pacific Industries not only owns forestland and sawmills, it processes the lumber into moulding and millwork, and from there into highly detailed and specialized wood windows and doors. We pride ourselves on both the quality of the products we make, as well as the service we offer to our customers. This is never truer than during periods of economic recession or stagnation. As anyone in the housing, construction and home improvement industries can attest to, the past few years have been among the most challenging in recent history. When there aren’t as many new orders coming in, if construction companies choose not to go with customized products, and homeowners choose to put off home renovations, existing customers become even more important to a business’ success. Providing them with timely and professional service goes a long way to keeping current customers satisfied and a business’ doors open. Sierra Pacific recently invested in technology to help our customer centers improve service and reduce the time it takes to find a specific drawing from archived files by using an AutoCAD search tool. Every product Sierra Pacific makes starts with a highly detailed computer-aided drawing (CAD) of the precise measurements, shape, size and design of the doors or windows the customer has requested. With close to 250,000 such CAD drawings and 11 different service locations throughout the western United States, Sierra Pacific’s service team needs to be able to access and locate specific drawings quickly and effectively. If they aren’t able to, our service – and our reputation – are negatively affected. Given the need to quickly identify the right CAD drawing, Sierra Pacific deployed DrawingSearcher, a search program available from Docupoint for AutoCAD drawings. With DrawingSearcher, files can be brought online and the software locates and indexes the files based on their file name, content or metadata. Using DrawingSearcher, a search that would otherwise have taken days - if not weeks – now takes just a few minutes. Before Sierra Pacific had an AutoCAD search program, someone from one of our service centers would have to search through the physical drawings in the company’s archive until they found the specific drawing that the customer needed. Finding this proverbial needle in a haystack was a cumbersome, timely and expensive prospect for Sierra Pacific, and our customer service lacked efficiency because of it. By utilizing DrawingSearcher, our service team has become a more nimble, responsive and effective department – one that is better suited to meet and address the needs of our customers and answer specific questions about their Sierra Pacific products in a professional and timely manner. Sierra Pacific has been using DrawingSearcher for close to 10 years, and continues to see enormous benefits from utilizing such a system. After examining all the different options that were on the market, we chose DrawingSearcher from Docupoint because of its functionality, ease of use and ability to quickly search and find AutoCAD drawings. Anyone who uses an Internet search engine like Google, Bing or Yahoo is able to use DrawingSearcher, which is accessible from any computer with an Internet connection. It lets us search for specific words or codes within our AutoCAD drawings so the service team can identify specific drawings for specific customers quickly and effectively. Docupoint’s DrawingSearcher has made accessing our AutoCAD archive of 250,000 drawings much easier, enabling superior customer service by allowing us to better meet the needs of our customers. Sierra Pacific continues to grow and our customers continue to rave about our highly specialized doors and windows. With a sophisticated AutoCAD search program like DrawingSearcher, we can ensure timely and efficient customer service. What used to take several hours now takes minutes, allowing us to give our customers the same level of specialized, customized care that they have come to expect from Sierra Pacific.